​​​​​1813 Adoniram Judson arrives in Rangoon. 1819 Judson’s first public worship in Burmese. 1821 The first mention of English Services. 1854 Land granted from the East India Company enables a small church to be built on Merchant St.
1865 Rev’d. A.T. Rose and J.H. Cushing served as acting pastors. the absence of Mr Rose” Extract from the Missionary Magazine. 1880 Rev’d. F.T. Whitman arrives.Over the next few years the church was split and eventually formed intothe Immanuel Church and the English Baptist Church which called pastors from England. The English Baptist Church eventually obtained a site on the corner of Judah Ezekiel and Bigandet Streets and Mr Madden was the pastor, after he resigned, Mr Disney took charge. 1883 The Merchant Street building was sold and a new church building was constructed, the Immanuel Church on the corner of Dalhousie and Barr Streets, the English and Teluga congregations used this chapel with the Burman Church meeting in its own chapel at Lanmadaw. ​​1885 The Barr Street building was dedicated. ​For three years from 1887 the church was supplied by Rev’d. Thomas Evans, (three months) and then by Rev’d. D. Cushing. ​1888 A report of the 33rdanniversary was found in the belongings of the late Dr. St. John by MissCharity Carmen who sent it to the compilers of this booklet. “The anniversary of the English Baptist Church was held on the 7th November 1888, Dr. Cushing was the pastor, A.M. Buchanan was Church Clerk and J. Reynaud the Treasurer. Rev’d. A.F.A. Moir of the Presbyterian Church presided on the occasion. After prayers there followed the reading of a report from the Church Clerk regarding finances for the last year. Its adoption was moved by Rev’d. F.P. Sutherland of Zigon and seconded by Rev’d. W.F. Armstrong of Moulmein. After refreshments prepared by the ladies of the congregation the Treasurers report was moved by Rev’d. L.W. Cronkhite of Bassein, J.E.G. Villa seconded the adoption of the report with a brief pithy speech which he closed with the announcement of a subscription of Rs. 275 by three of his friends towards the liquidation of the Rs. 1,275 still due on the Church building and the request that the congregation would remove the remaining Rs 1,000 at once. Quick responses followed and in five minutes the money needed was pledged and the Church was free from debt. 1896 The Immanuel Church now reformed as The Immanuel Baptist Church of Rangoon and the Immanuel Church was the title of the Barr Street building. The organisation was headed by Rev’d. W.F. Armstrong as chairman and Professor E.B. Roach as secretary pro-tem. A council was formed from several of the nearby Baptist Churches and Dr. Hicks was chosen as its chairman. 1897 Rev’d. and Mrs Grey arrive. 1900 Rev’d. Ernest Grigg became pastor of the Immanuel Church. 1911 Rev’d. Frank Singiser became pastor. 1918 Construction of The Community Hall. ​1929 - 1935 No permanent pastor,missionaries in Rangoon and Insein officiated including Rev’d. A.C. Hanna (the grandson of Judson) in addition to his work at the Insein Seminary. ​1935-1937 A new pastor arrives - Dr. and Mrs F.E. Eden. ​​ ​Mr and Mrs C.C. Scherling, Mr and Mrs James Lee, Mr and Mrs W.H. Wason, Mr and Mrs Roland Hutton, Miss Beryl Hutton, Miss E.D. Walker, Mr and Mrs Roy Taylor, Mr and Mrs G. Davis, Mr and Mrs B.M. Pascal, Mr and Mrs Forkgen Sr. Although not members the Minus families were keen supporters of the Church. 1937 Rev’d. Thomas Eugene West officiates until the Rev’d and Mrs C.M. Lloyd arrive. Rev’d Lloyd served until the war began in 1942. 1938 The members of the English Baptist Church united with the Immanuel Church. ​1942-1945 During these war years the building in Barr Street was damaged, the Church continued its services from house to house, meeting when possible, and this responsibility fell on the shoulders of Miss Nancy Joseph. She commenced immediately to collect funds for the building of a new Church. Those members who had evacuated to India, hearing that the building was destroyed also collected funds which they brought to Burma in 1945 when the evacuees returned. ​that dared me to take the risk and I wept when I saw the condition that it was in. ​I tried my best to buy as many Hymn books as possible, asking my niece and friends who were working in town. They were being sold at 8 annas each but the biggest trouble was that a stall would be here today and gone tomorrow, not permanent fixtures. I wanted to get as many as possible to save them being torn and used in the market and also thinking ahead of the days when our Church would function again. The folks who bought them had to go during lunch hour. Having to buy their lunch was a problem as there were very few hotels of any kind and conveyance in the evenings was another problem. Many a time they had to walk back home to Myenigone, three miles from Rangoon, so they could only but two books at a time. Anyway I managed to collect about 40 books but sad to say I have only 11 books at present, as the rest, with a lot of my other books, such as fancy work and religious books, got destroyed by white ants. They were left with a friend of ours packed in a large packing case which I bought from the A.B.M. Press before evacuation. I have had to move about from place to place four times during this period and on one occasion we had to leave Rangoon, going to a riverine station called Htantabin opposite Hmawbi, owing to my poor state of health at the time. ​​and last interview we had with them. 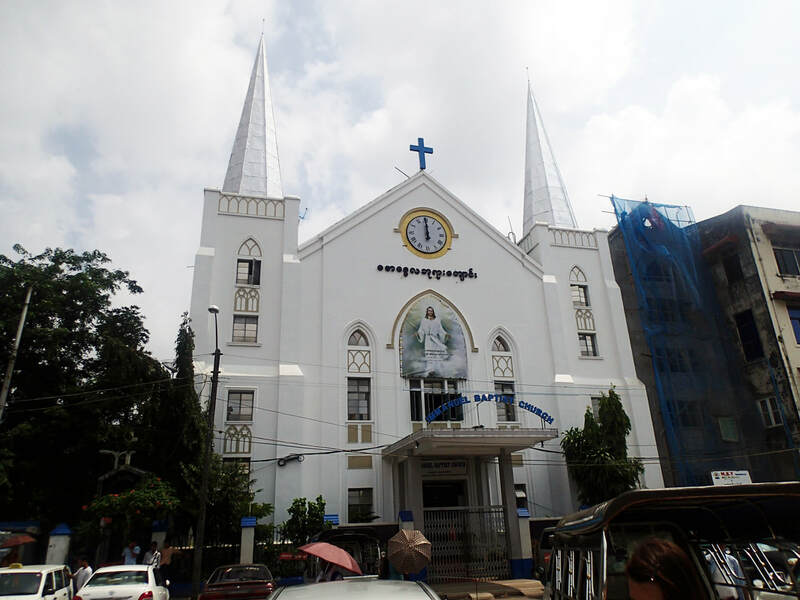 ​It was not for our own Church members so much, as there were very few of them and they were scattered all over the city from Insein to Tamwe, that I was so keen to get the building. The first point I felt that it was our responsibility to see that those of us who were able to play a part should try our best to see that the Church should not be desecrated, and if we used it as a place of worship, we would save the building from being demolished by the local people. We would have a caretaker to live on the premises in the room Francis had occupied. “Please get our Church ready as soon as possible, we have to go here, there and everywhere for Church Services these days and do not have a Baptist Church to worship in.” They tell me this with tears in their eyes and I have been more eager that something be done. ​Our Church has been damaged and all the stained glass windows have been removed and the local people have done just what they pleased in there, so it is just a mass of dirt. The Indian Baptist women are willing to carry water themselves and wash out the place but the trouble is there are no doors or windows so the wicked people would come in again and dirty the place. So I wrote and asked the authorities concerned for a permit to carry our petty repairs and the matter is still pending. ​​badly cracked. The roof and other parts are quite all right. As for the Community Hall, the roof is badly damaged and all the doors and windows are missing, also all the water pipes. ​Our earnest desire and prayer has been to see in what way I could play a humble part during those years of war, and today in peace conditions, whereby my dear Church could be ready for consecration and worship. That will be indeed a great and glorious day. So in my feeble way with the effort of a few other kind friends we have started getting donations for repairing for the last two months. So far the amount collected is over Rs. 600 from Immanuel Church members only. I am collecting monthly subscriptions. This is to be kept aside to be used only when the Church functions. We intend starting in our members’ homes every Sunday, beginning from September 9th, the first to be held in the home of A.C.E. Aaron, 220 Montgomery Street. Those of us who were here during the occupation realised what it was to be without a Church and God gave me the privilege to help start again the work of Immanuel Baptist Church. There were nine members of our Church in Rangoon at that time. ​The Church belfry was bombed in August 1944 and the walls were badly cracked but the roof was in a good condition except for a few places where it leaked. The Community Hall was alright but not the roof, which was in a bad condition. Water from the upper floor leaked onto the lower floor. In the dry weather we had services in the lower hall but when it rained we held services in the Church. ​In July 1945 we started to collect donations from all Baptists, who were more than willing to give, as we were making plans to resume services in the Church. Other Christians too donated generously. We got a letter of authority through Mr Y. Judson from Dr. E.C. Condict who had come into Burma with the American Army. Thra Ple Baw and Mr D.I. Clement of the Telugu Church did visiting and received donations and when in contact with our folks coming over from India I also received donations. ​Special mention is to be made of one Telugu Baptist woman who gave me Rs. 25 in silver coins and two gold chains from off her neck worth about K. 175 in gratitude to God who had wonderfully cared for her and her family during the war years. In August 1945 I asked members of our Church to subscribe monthly. This was to be set aside and used only when the Church was organised. The donations were to be spent in rehabilitating the Community Hall. A summary of income will be found at the end of this story for the seven months that I was the custodian of all moneys received, except the Church Collections of other groups when they worshipped in their own languages. However, when an appeal was made to the other language groups at any time, a generous response was always given. There were no banks functioning at that time. While Rev’d. Lloyd was in Rangoon he kept the cash in an army safe. When he went away I kept it till the banks began functioning early in 1946. It took time for the city to get in order after the liberation. In August notification appeared in the newspapers that all places of worship occupied by the military were to be de-requisitioned. We were very glad to read this, as the Madras Sappers and Miners had occupied the Community Hall where they even cooked food on both floors. At that time the Community Hall was intact with all the doors and windows. ​We decided to start an English United Church Service (combining all who spoke English) meeting in houses. So on September 9th we had the first one in Mr A.C.E. Aaron’s home at 2p.m., on the 16th at my home, on the 23rd at Mr Ellis’ and again on the 30th at my place, where we had the first Communion Service after the war. Rev’d. C.M. Lloyd our pre-war Pastor who was now a Captain in the army put a notice in the papers that he would like to contact former Immanuel members. He met Dr. Condict who gave him my address and told him that we were hoping to resume services in the Church and were collecting funds. So Rev’d. Lloyd came to see me on the 2nd September. I told him of the services we had had. He conducted both the services in my home and was very pleased at the fine start we had made, both in having services and also in raising funds. ​On the 30th September he asked me if he could announce the next service in the Community Hall as the army unit occupying the place had been given orders to quit. This meant a lot of work for us to get the Hall ready in a few days’ time. ​Anyway we ventured out on faith and made the announcement. Within the short period before we occupied the place, doors and windows had been stolen, including the main door. These were taken and sold. Mr Clement and I tried to clear up the place which was in a terrible mess. No labour was available at that time. We swept and cleaned on Saturday only to find on Sunday morning that things were messed up again, and so there had to be another clean-up. The Telugus decided to have the first service at 8 a.m. They sat on mats. The Tamils started to worship from the 3rd Sunday, 21st October at 9.30a.m. The Karens at 10.30a.m. and the English speaking at 3.30p.m. Everything did not work out smoothly as the following incident will reveal. After much difficulty we got a caretaker (supposedly Christian) who turned out to be a drunkard. U Thaung Tin was the contractor who was getting the hall fixed up with second hand doors and windows, the only type available (all stolen property.) New ones sold in shops were out of the question as prices were too high. ​Work was only done for a few hours per day. U Thaung Tin’s assistant came to inspect the work, and left his cycle for a short while, only to find the cycle and caretaker had disappeared. I was informed immediately, and it took me a good few hours to find Mr Clement, who was reported to the police. In the evening the man was caught very much the worse for liquor, denying he stole the cycle. He was in the lock-up for a few days, but the cycle was never traced. In those days a cycle was worth about K. 450. We were indeed greatly blessed by the next durwan who was a Brahmin (Hindu) who did very excellent work and was very honest. other things. The small organ which we recently gave to the Kanbe Church was purchased by Rev’d. Lloyd when he went to Calcutta on some army business. The piano which we are still using is what he presented to us. ​On being promoted to Major he was sent to Moulmein for a short while. He left the Army Christian Fellowship (a group of ardent Christian laymen) in charge of the services. They got in touch with Chaplains to conduct Communion Services and on other Sundays they took the Services. We started Prayer Meetings on Thursdays from 6.30 to 7 p.m. after which a Bible Study Class was conducted by the A.C.F. as they were free only at that time. Those of us who attended this class were greatly enlightened on the scriptures by these zealous living Christians. Through all those days to this, God is wonderfully watching, leading, guiding and caring for us, praise His name. ​1945 - 1946 Rev’d. C.M. Lloyd returned to Rangoon as an army Chaplain and together with army personnel he assisted in getting services started again. ​ In due time the Community Hall was rehabilitated and lights were installed. The main Church building was considered unsafe, a wall had suffered a crack and the tower was damaged, it was dismantled and the building materials were sold. ​1947 Rev’d. Addison J. Eastman became the new pastor. The English Baptist Church Building was sold to the Salvation Army. 1949 Rev’d. Walter Zimmer takes over as pastor when Rev’d Eastman was transferred to the Judson Chapel. 1952 The cornerstone of the new Church building was laid by Rev’d. Gustav Sword. Mr Brush was the builder until his retirement, Dr. Dickason gave great help and support and worked closely with the engineers Alec Munro and Roy Taylor. 1952 The new building is dedicated. The Church membership had grown from the nine members who began services in 1945 to about 350 members in 1955. ​All the Immanuel Church records were lost in the war, the following is a post war membership list. Carew Thora Helga Rangoon Development Trust Qtrs., Bogyoke St.
Carew Robert Richard Rangoon Development Trust Qtrs., Bogyoke St.
Munro Alexander C. E. Engineer, P.W.D. Ngwe Mrs Edward Tun (Alison Gaudoin) 11 Budd Rd., Rangoon. Jensen Mrs V.J. (Irene Mozes) U.S.A.
Scherling Mrs C.C. (Freda) U.S.A.
​The Centennial book committee:- Roy Taylor, Miss Hazel Johns, Matthew Joseph, Thomas D’Silva,Russell Brown. Artwork - Mrs June Hundly.